Angular Contact Spherical Plain Bearing GAC.S Series are manufactured using excellent quality raw material with latest machines at the production unit of our vendors. Owing to excellent quality, these bearings are widely used in the sugar mills, railways, steel plants, cement companies and rolling mills. The inner and outer materials are bearing steel GCr15, hardened, phosphate, sliding surfaces coated with molybdenum disulfide. 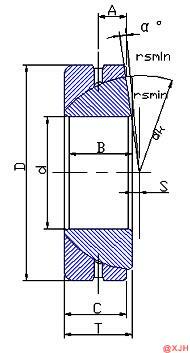 Resistant to abrasion, self-aligning, suitable for radial and axial loads in one direction mechanical agency. We are highly renowned manufacturer and supplier of Angular Contact Spherical Plain Bearing GAC.S Series. Apart from this, clients can avail this from us at market leading prices. If you have any question feel free to contact our professionals who are always available to help you at any time. 4) Features of structure: With oil groove and oil holes in outer race.